An impressive gift for an anniversary or event, our custom engraved cutting boards come are just the thing to show your admiration or affection for someone special. You can design your own message by simply picking the size of the engraving, placement, and the font and letting us know your special message. See above for list of fonts to choose from. Typical turnaround is 5 to 7 days. Volume Pricing - Save when Ordering in Bulk! Looking to do a special project for clients or need an ongoing relationship for customized boards? CuttingBoard.com can get it done! We've done work with real estate agents, wedding planners and gift buyers. From 1 to 2,000, we will design the board you are looking for. Please contact us at help@cuttingboard.com or call us at 253-234-7569 for a quote. 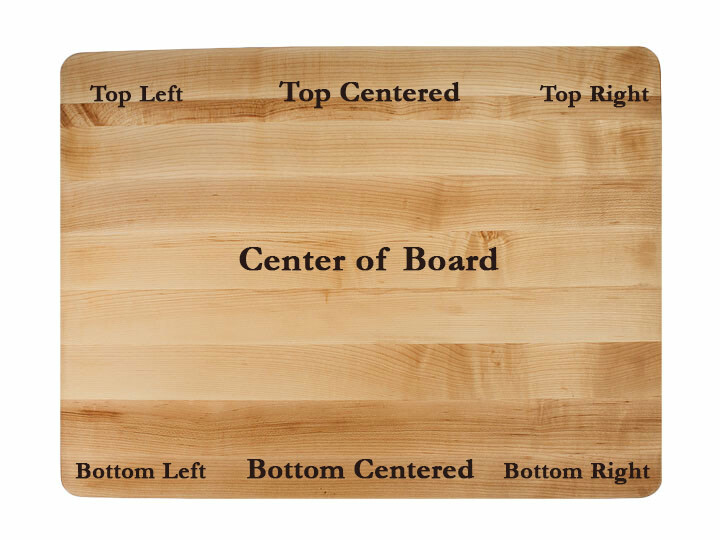 Click the button below to add the Personalized Large Walnut Cutting Board 24 x 15 x 1.25 to your wish list.